I had no idea what I was getting myself into when I requested an ARC of this book but what I found was an unlikely protagonist in Bobby Hale. Hale is a Civil War veteran and deserter and veteran and deserter. He is a man who doesn’t know what he wants and follows his gut, which changes as often as his diet. He finds no moral conflict in departing in the middle of a job with the military, but he’ll risk his life to defend a runaway Indian girl. Everything would typically make Hale an unlikeable hero, but the truth is, author Robert Bausch has made Bobby Hale incredibly likeable and believable. He rides a moral line that we can identify with and wish, in our own way, that we could be strong enough to follow. Hale is an observer at the Battle of Big Horn. He could, and perhaps should have been a participant, standing up alongside his friends and comrades. The average literary hero most likely would have done so. But as Hale follows his own principles, he watches, learns, and runs away. What he sees is not something we typically learn in the history books. I have not read any other Robert Bausch novels, but if his other works are character-driven books such as this, I’ll be very eager to dig into them. Looking for a good book? 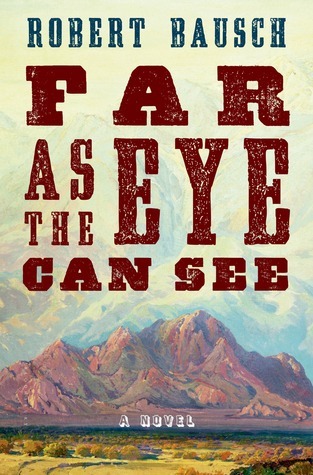 Far As the Eye Can See by Robert Bausch is a captivating character driven novel set in the Old West just after the Civil War.